U.S. social and cultural history, 1750-1850; the American Revolution; Transcendentalism; the history of the book in the United States; New England studies. The Transcendentalists and Their World, a social and cultural history of Emerson and Thoreau and the Concord, Massachusetts community in which they lived and wrote. A native of Bridgeport, Connecticut, Robert A. Gross received the B.A. in American civilization from the University of Pennsylvania in 1966 and the M.A. (1968) and Ph.D. (1976) in history from Columbia University. He taught at Amherst College (1976-88), the University of Sussex (1981-83) and the College of William and Mary (1988-2003) before coming to UConn. 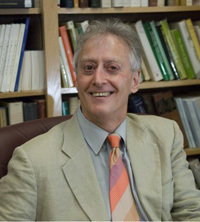 He is the recipient of various national awards, including fellowships from the Guggenheim, Howard, and Rockefeller Foundations, the National Endowment for the Humanities, and the American Antiquarian Society. Prof. Gross specializes in the social and cultural history of the U.S., from the colonial era through the nineteenth century. His first book on the American Revolution, The Minutemen and Their World (1976), won the Bancroft Prize in American History; it was issued in a 25th anniversary edition in 2001. He has continued studies of the Revolutionary era in such works as In Debt to Shays: The Bicentennial of an Agrarian Rebellion (1993). For two decades he has been deeply involved in the interdisciplinary field known as the history of the book, serving on the editorial board for the multi-volume History of the Book in America published by the University of North Carolina Press and co-editing with Mary Kelley the second volume of the series, “An Extensive Republic: Print, Culture, and Society in the New Nation, 1790-1840,” (2010). His other recent work examines New England writers — notably, Ralph Waldo Emerson, Henry David Thoreau, and Emily Dickinson — in historical context. From that project has come The Transcendentalists and Their World, to be published by Hill & Wang. A onetime journalist at Newsweek and free-lance writer for Harper’s, Saturday Review, and Book World, Prof. Gross addresses his scholarship to academic and general audiences alike. He has consulted on museum exhibitions and documentary films, lectured as a Fulbright scholar in Brazil, Denmark, Italy, and the Netherlands, devised public humanities programs for the Bicentennial of the Constitution, directed a NEH summer institute at William and Mary to commemorate the life and thought of Thomas Jefferson, and spoken frequently in NEH and Teaching American History programs for community college and K-12 teachers. He has served as chair of the Program in the History of the Book in American Culture at the American Antiquarian Society and as book review editor of the William and Mary Quarterly. Editor (with Mary Kelley), “An Extensive Republic: Print, Culture, and Society in the New Nation, 1790-1840,” volume 2 of A History of the Book in America (Chapel Hill, N.C.: University of North Carolina Press, 2010). “A Yankee Rebellion? The Regulators, New England, and the New Nation.” New England Quarterly 82 (March 2009): 112-135. “Seeing the World in Print,” in Sabrina Baron, Eric Lindquist, and Eleanor Shevlin, eds., Agent of Change: Print Culture Studies after Elizabeth L. Eisenstein (Amherst: University of Massachusetts Press, 2007), 378-96. “Quiet War with the State: Henry David Thoreau and Civil Disobedience,” Yale Review 91 (October 2005): 1-17. Books and Libraries in Thoreau’s Concord: Two Essays. Worcester, Mass. : American Antiquarian Society, 1988.